Follow in the steps of the Japanese print masters. 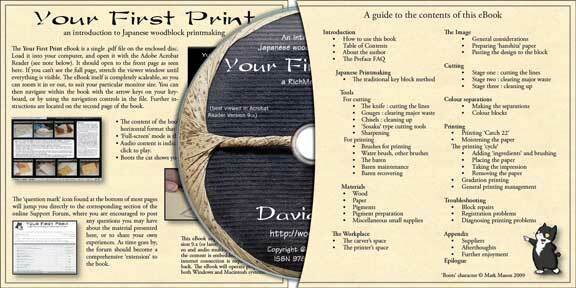 This RichMedia eBook on CD contains all of the information you need to make woodblock prints using traditional Japanese techniques. With 30 years of experience, Tokyo based printmaker and Baren Forum founder David Bull is the perfect choice for this guided tour of the craft. RichMedia eBooks contain audio and video clips as well as pages that can be read at your own pace. The audio/video clips can be viewed on any Mac or PC computer running Adobe Acrobat Reader version 9 (or later) free software. (They cannot be seen on an iPad.) The video and audio content is included on the CD so no internet connection is required for playback. More information on this eBook - the format, how to use it, and other relevant details - can be found on this page. This is one of the 59 wide-screen pages that are full of information. Read it at your own pace! Zoom in on the high resolution images to see every detail. Click on the image to see a larger version. 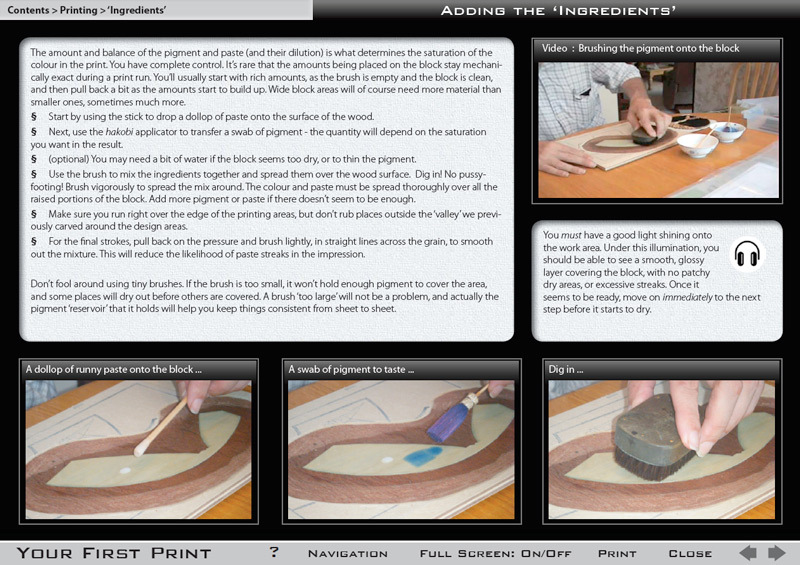 The eBook also contains numerous audio and video clips (the headphones in the picture above indicate an audio link) showing every important stage of the printmaking process. Additional clips talk about some of the older craftsmen David has known, others include details about the tools and materials you see him using. Purchase of the CD includes free membership (posting and discussion privileges) in the online Support Forum. Access does require an internet connection. Here you will find additional information, David's answers to questions and a chance to share your experiences. From David's introduction: "Remembering back to the days when I was first exploring this craft, I have created the book that I desperately wanted back then, but which didn't exist - a book that included everything that I needed to know. I have tried to create a highly practical and focused guidebook that will take you - step by step - completely through the process of creating your first print, answering (hopefully) all the questions you will ask along the way." A sample containing 24 pages from the book (including a number of audio and video clips) can be downloaded by clicking here. It is a 7.5Mb 'zip' archive file, which should easily open in your computer (Mac or PC) to reveal the enclosed pdf file, along with a READ ME file. Nothing else is included in each download, just these two files. Please give it a try! Whether you are making your first print or your 50th, there is so much good information here. For example, the video clip showing David recovering a baren? Priceless.